Piano Bar Jazz at its best. 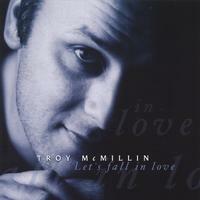 Acclaimed Australian Jazz vocalist Troy McMillin sings a collection of timeless standards. My main focus for this project was to create a record capturing the intuitive relationship between a singer and his pianist. Musical storytelling of the 1930's and 40's swing era was also a big feature of this album, a genre I have sourced music from throughout my career. The 'piano bar' singer famous for this music has sadly become extinct since the passing of 'Ol Blue Eyes', kept alive only by the likes of Tony Bennett and a handful of others. I hope to be one of the few to restore this dying art form. The timeless music of Let's Fall in Love is ideally played relaxing with a glass of red and a special someone to fall in love with, all over again. Enjoy. Does it "his way", respects and owns the lyrics to a song just like the great American song stylists. A true vocal original. Check this out, he's still a young guy and already has great maturity in his interpretations.